This dessert is so incredibly rich and delicious! This is the ultimate chocolate-caramel treat. 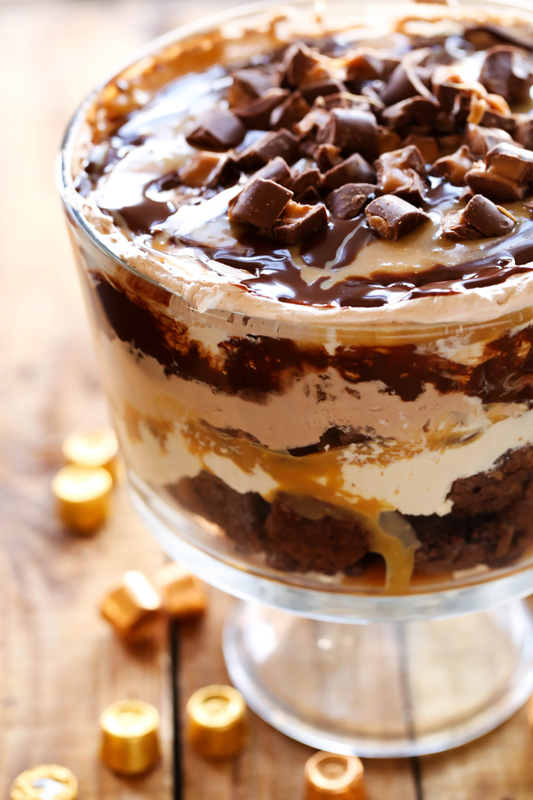 With layers of ROLO brownies, caramel mousse, gooey caramel, chocolate mousse, chocolate sauce and ROLOS, this trifle is sure to be a show stopper wherever it goes! I LOVE trifles for so many different reasons. They are complete show stoppers in appearance and taste incredible! With the holidays fast approaching, it is great to have recipes that will feed the masses with a smile, and trifles are wonderful for that. Today, I have partnered up with HERSHEY’S to bring you one unforgettable, rich, crowd-pleasing trifle. It begins with my favorite family recipe for fudgy brownies. 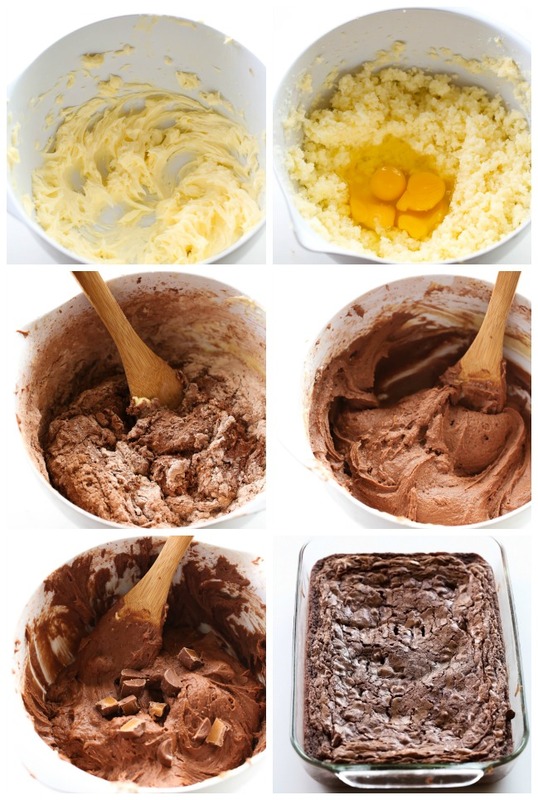 I adore this brownie recipe. To make the brownie recipe a little more special, I added in some chopped up ROLOS to give it an added bite of chewy caramel. They make such a fabulous addition! While brownies are cooling, assemble the other remaining layers for the trifle. The chocolate sauce is such a smooth and tasty recipe. It is used both as its own layers in the trifle and also in the chocolate mousse portion. The caramel mousse is also quite spectacular. It has cream cheese as its base and brings such light and fluffy element to the trifle. Now comes the fun part where you get to take all your creations and assemble them together to create this yummy caramel-chocolate dessert! 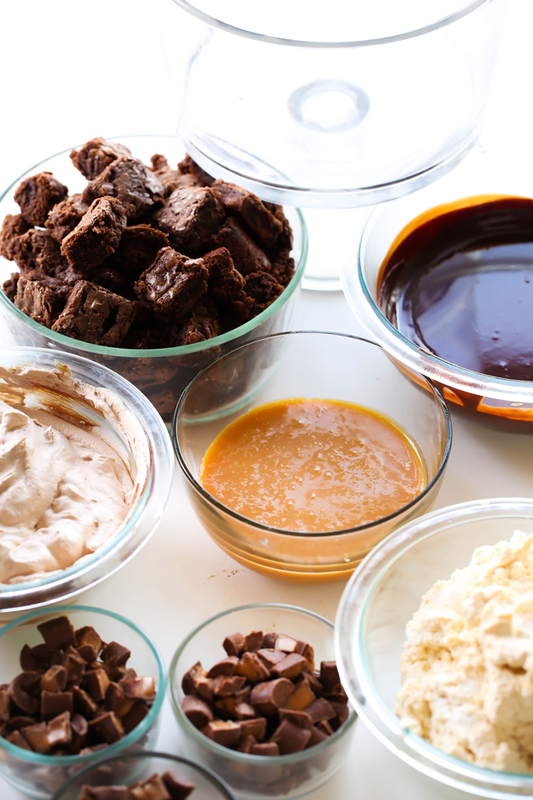 The last layer you will whip up will be the caramel sauce. It will set up and cool down pretty fast which is why you save it for last. Not pictured directly below in the trifle assembly picture is the Chocolate Mousse layer and Chocolate Sauce layer beneath the second layer of brownies. They are there though, as you can see beneath that second layer of brownies and they are HEAVENLY! This dessert is so incredibly rich and delicious! 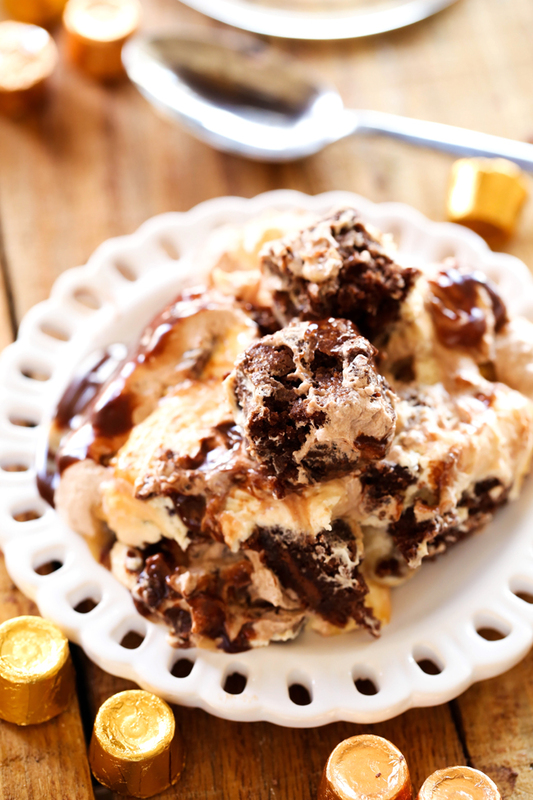 With layers of ROLO brownies, caramel mousse, gooey caramel, chocolate mousse, chocolate sauce and ROLOS, this is sure to be a show stopper wherever it goes! 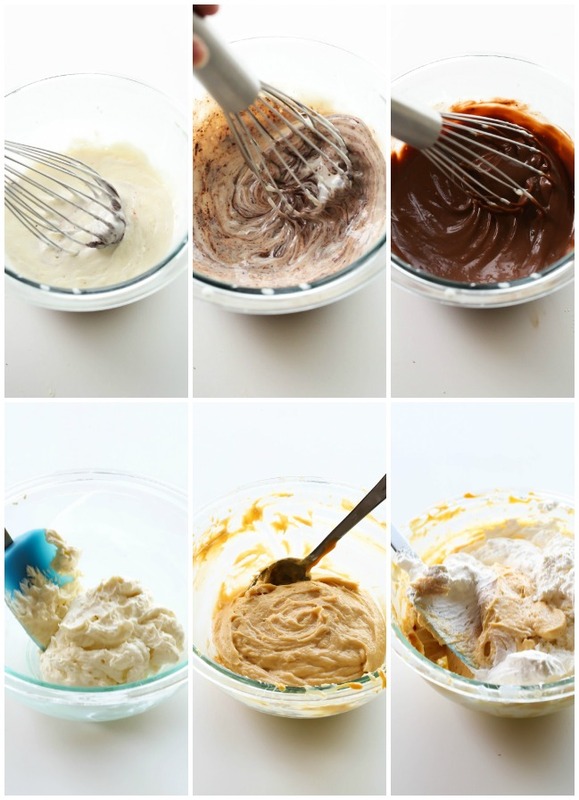 Cream butter and sugar together in a large mixing bowl. Add vanilla and eggs and mix well. Add salt, unsweetened cocoa and flour and stir to combine well. Do not over mix. Stir in chopped ROLOS. Bake at 350 degrees F for 23-26 minutes. Preform toothpick test in center to test for doneness. In a medium bowl, cream the cream cheese and sugar together until well beaten. In a medium microwave safe bowl, combine 22 soft caramels with 4 ½ teaspoons heavy cream. Microwave in 30 second increments, stirring between each increment until smooth and completely melted. Allow to cool. Beat in cooled caramel with the cream cheese until smooth. Fold in thawed frozen whipped topping until well blended. Cover and set in fridge until ready to assemble. In a medium large safe bowl, combine 1 cup heavy cream and cornstarch and whisk until cornstarch has completely dissolved into heavy cream. Add HERSHEY’S Semi-Sweet Chocolate Chips, give a quick stir and heat in microwave for 40 seconds. Stir mixture and place back in microwave and heat for an additional 30 seconds. Stir after 30 seconds. Repeat heating for 30-second increments and stirring in between each increment until mixture just begins to boil. Allow it to cool completely and set up. Stir in ½ cup of completely cooled Chocolate Sauce recipe above to the thawed frozen whipped topping. Cover and place in fridge until ready to assemble. In a medium microwave safe bowl, combine 30 soft caramels with 2 Tablespoons heavy cream. Microwave in 30 second increments, stirring between each increment until smooth and completely melted. Allow to cool. Cut cooled Brownies into 1x1 inch cubes. Before beginning, note that you may have to gently press down each layer to fit everything in. 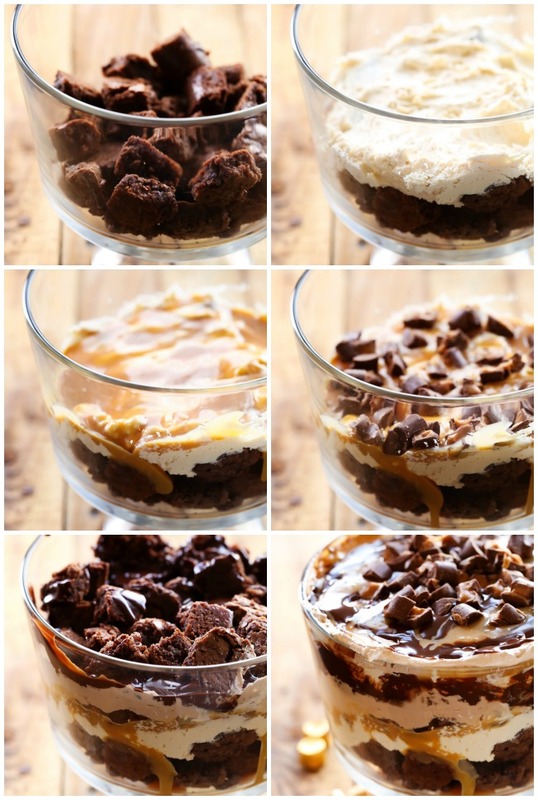 In a trifle bowl, layer ½ of the brownie cubes. 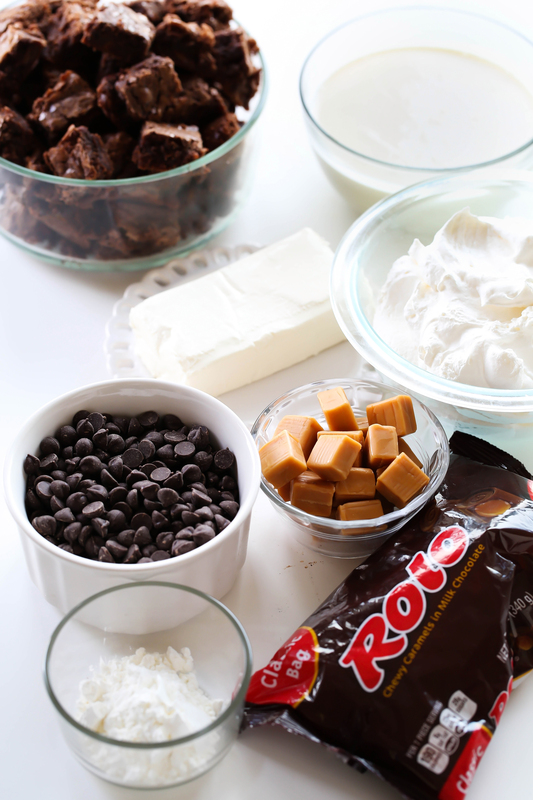 Spread half of the CARAMEL MOUSSE over the tops of brownies. Pour and spread half of the CARAMEL SAUCE over the top of the Caramel Mousse. Sprinkle half of the chopped ROLOS over the top of the Caramel Sauce. Carefully spread half of the CHOCOLATE MOUSSE over the tops of the ROLOS. Pour half of the remaining CHOCOLATE SAUCE over the Chocolate Mousse. Repeat layers one more time, reserving a little Caramel Sauce, until you get to the Chocolate Mousse. Drizzle as much of the remaining Chocolate Sauce and the remaining Caramel Sauce over the top of Chocolate Mousse and garnish with a few remaining chopped ROLOS. Thank you! This just might be on the dessert menu for Christmas this year! Do you have any idea how many this would serve? I'm going to make this for our Christmas desert this year. We love your recipes and have never been disappointed and I've made over 20 of your different recipes! I only have the question of would this be okay to make Chrisrmas Eve and refrigerate for Christmas desert 24 hours later? It would help to have it already prepped! This looks amazing! I am planning on making this for a party next week and am wondering how far ahead could I assemble it? Should I make all of the "pieces" the day before and assemble the day of? Thank you! I have the same question. Did you assemble the day before? If so, how did it work? Looks yummy!! I would like to make it for Easter. Can it be made a day ahead? This looks so fantastic. I am making homemade caramel sauce and chocolate sauce today. Tomorrow making the brownies and freeze them. Brownies freeze beautifully. This will make it easy to assemble the day of our dinner. Thanks so much for sharing Nikki. Wow fantastic recipe for any occasion. Very Rich and Delicious, (served with coffee)- I will make this, again! Made this for Easter and it was wonderful! My only problem was with the caramel sauce. It did not drizzle well once cooled. I think next time I will use a store bought sauce. Other than that, turned out great! I have caramel sauce but no wrapped caramels on hand....could I soften the boughten jar sauce and use instead of wrapped caramels? Why do the ingredients say, "Caramel Sauce" , unwrapped soft caramels, but the recipe doesn't ?